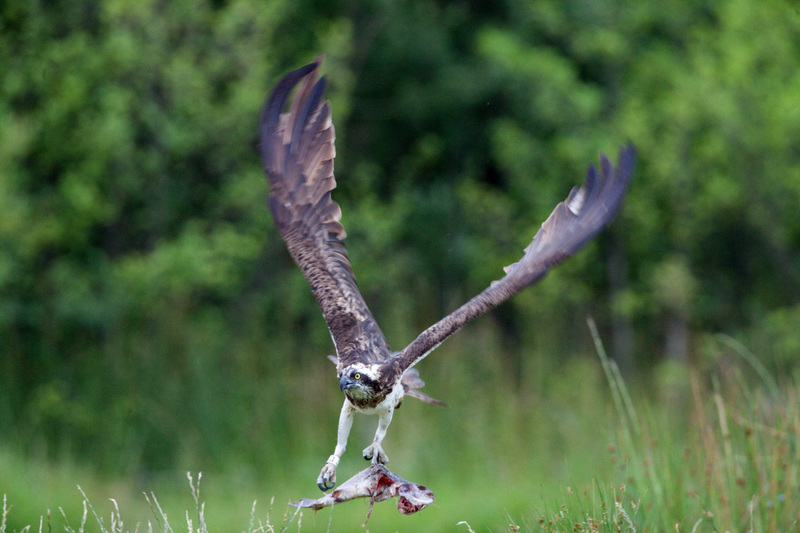 There are many iconic birds and mammals in the Highlands such as golden eagles, black grouse, red deer and otters. There is one bird that is not only one of the most iconic but also a migrant as it leaves our shores in the Autumn and spends the winter way off in Africa. It is the famous osprey and, rather unexpectantly, it is one of the earliest of the many migrants to return to nest here. Last year, for example, the first migrant I saw was not a sand martin or swallow I had deliberately gone to Loch Flemington to see but a lone and magnificent osprey circling rather ominously over a fish farm in Strathnairn. Looking at the earliest dates for the return of the ospreys in the annual bird reports from the Highlands in the last three years have been 22nd March, 21st March and 19th march. This year the first date I heard was from the renowned Loch Garten nesting site where the first bird back touched down on the nest at just after 6.00 pm on 27th March. The fascinating aspect of such records is that most of the birds at such famous sites are ringed with colour coded rings apart from the usual metal ones. This means with a reasonable view the individual birds can be recognised. Staff at Osprey Centre were overjoyed to find it was EJ, named after her ring letters, and ready to face her 11th year in the Cairngorms. As soon as EJ landed she started to re-arrange nest material and scraping a nest cup which is a sure sign of her intentions. Fortunately the RSPB staff had just installed a camera at the nest in time for people to see the event on line. Last year when I was there they were expecting EJ to lay another egg and when I got back home I switched the computer on to find she had laid the egg just after I had left the centre. Such are the advantages of modern technology! As for EJ she, and for that matter the staff at the centre, are hoping that her partner last year, called Odin, will soon be joining her. Keep looking at the website for the latest news. Meanwhile at another osprey site at a Centre that is getting to be as well known as Loch Garten, the first osprey had also arrived back. She was at the Scottish Wildlife Trust Reserve and Centre at the Loch of the Lowes Reserve near Dunkeld. The osprey is called Lady, the oldest breeding female osprey recorded in the UK. This 27 years old bird of prey immediately saw off another female, a young bird, that attempted to land on her nest. Perhaps it is a sign of Lady’s age and experience that the intruder did not even put up a short rebellion but left. Lady started to dig at the old nest and taking out grass that had grown over the winter and re-arranging some sticks. The male arrived and they mated three times in the afternoon so the low temperatures were not affecting their routine. Lady is amazing as she has lived three time longer than an average osprey. In her lifetime she has laid 64 eggs with 49 going on to hatch and successfully fledge from the nest. A record by any standards. The male is called Laddie and is Lady’s fourth. Interestingly, whilst other birds of prey such as the sea eagle and the red kite had to be re-introduced, the ospreys did it on their own. Perhaps the most successful conservation story of recent times, perhaps ever. This entry was posted on Tuesday, April 30th, 2013 at 10:31 am and is filed under Wildlife in the North .